LONDON, England (CNN) -- A natural gas dispute between Russia and Ukraine flared Tuesday when Ukraine accused the Russian supplier of cutting supplies to Europe, and at least nine countries said their supply from Russia had been cut or reduced. 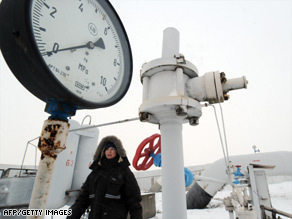 A woman passes in front of a manometer set on a gas pipe in the Ukrainian city of Boyarka, near Kiev. Ukraine's state-run gas company said Gazprom, the Russian energy giant, had shut three of four export pipelines that take natural gas through Ukraine to the rest of Europe, significantly reducing supply. Gazprom said Ukraine was to blame for shutting the pipelines to Europe. Amid the finger-pointing, at least nine countries told CNN they were suffering a reduction or cut in natural gas coming from Russia via Ukraine: Austria, Bosnia-Herzegovina, Bulgaria, the Czech Republic, Germany, Greece, Hungary, Romania and Turkey. It is the latest twist in an ongoing dispute between Gazprom and Ukraine's Naftogaz Ukrainy, which normally receives natural gas from Russia. The two companies plan to hold talks on the escalating problems Thursday in Moscow, Naftogaz told CNN. With Ukraine's natural gas supply shut down, Gazprom has accused the country of siphoning off gas from the export pipelines to Europe. Medvedev said the company plans to file suit in the coming days to end the alleged practice. A spokesman from Bulgaria's Ministry of Economy and Energy told CNN their supply was halted Tuesday, and a spokesman for Romania's Economic Ministry told CNN it had suffered a 75-percent reduction "as a direct result of the dispute." A Turkish Energy Ministry spokesman told CNN that Russian gas supplied to Turkey through Ukraine had been completely cut. The country was raising supplies of gas from another pipeline in order to compensate, he said. The Czech Republic's supplies from Russia via Ukraine will be cut by 75 percent Tuesday, a spokesman from the Interior Ministry told CNN, and Austria was only receiving 10 percent of Russian-supplied gas via Ukraine, according to OMV, the country's central gas company. Greece was receiving no gas from Russia because of the dispute with Ukraine, said Makis Papgeorgiou, chief executive of Greek natural gas operator DEPA. He said the country was relying on domestic production and imports from Algeria and France in the meantime. Germany's Wingas said it noticed a reduction in supply of Russian gas coming from Ukraine on Tuesday. But Wingas spokesman Stefan Leunig said the company imports most of its Russian gas via Belarus and Poland and can take gas from Western Europe, thus avoiding any supply problems. Gas has been completely cut off to the Federation of Bosnia and Herzegovina, a secretary to Prime Minister Nedzad Brankovic told CNN. The government held an emergency meeting Tuesday afternoon to discuss the situation. "It is very, very cold in our country. Many people will now have to find an alternative solution for heating, but there is no other solution," the secretary, who declined to be named, told CNN. Without gas, the country could "collapse," the secretary said. Hungarian Energy Minister Csaba Molnar said the country had noticed a decline in gas being supplied via Ukraine starting on Monday, and was relying on reserves. The European Union presidency expressed concern but said it could do little. "The situation has changed dramatically," said Jiri Frantisek Potuznik, a spokesman for the EU presidency, now held by the Czech Republic. He said the Czech Republic can't be an arbiter because the dispute is between two companies, not two governments, but he said it would monitor the situation. "From a long-term point of view, it's unacceptable," Potuznik said. Gazprom shut off Ukraine's gas supply last Thursday after saying it had missed $2 billion in payments. It acknowledged that Ukraine may have paid part of that amount, but said that still leaves Kiev $614 million in debt. Ukraine denied owing the money and is currently meeting its domestic needs with supplies from storage facilities. Gazprom had reassured Europe that its natural gas supply, which runs through Ukraine, would not be affected by the dispute with Kiev. However, analysts are concerned that if the two sides fail to strike a deal soon more supplies will be cut in the next two weeks. Russia is the world's biggest producer of natural gas and supplies Europe with more than 40 percent of its imports -- mainly via the pipelines through Ukraine. CNN's Jim Boulden, Alysen Miller, Phillip Warrington Taylor, and Tom Boltman in London and Mike Sefanov in Moscow contributed to this report.